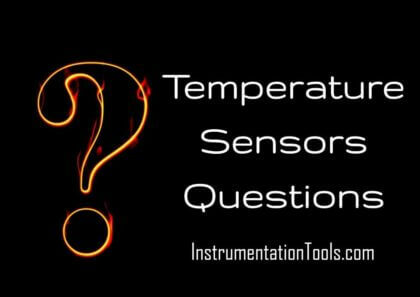 Study the Temperature Sensors Questions and Answers for your interview preparation. This article focus on Thermocouple and Pyrometer Questions. When a pair of dissimilar metalsis joined together, emf is induced at the junction of the metals, this effect is called seebeck effect. When a pair of dissimilar metals are joined together, emf is induced at the junction of the metals If the metal is connected to an external circuit some amount of current is drawn, due to which the induced emf will be slightly altered. When a pair of dissimilar metals are joined together, emf is induced at the junction of the metals. If temperature gradient exist along either/ both of the metal, the junction emf may undergo an additional slight alteration called as Thomson effect. A temperature measuring device formed by connecting two dissimilar metals and is based on the principle of Seebeck effect , peltier effect and Thomson effect. 5.Say the effects that thermocouple is based on? 6.What are the various types of thermocouple junctions? A series of identical thermocouple connected together in a casing is called thermopile. It is also Used for measuring average temperature. 9. Define law of intermediate metals? 10.Define law of intermediate temperature. 12. What are the compensating techniques used in thermocouple? 15. What are the sources of error in thermocouple. Usage of wrong type of thermocouple. 16. What are radiation methods of temperature measurement. 23. What are factors that affect the response of thermocouple.